Today's mission (and actually your mission for several days since for many people this is such a big task) is to declutter your basement. 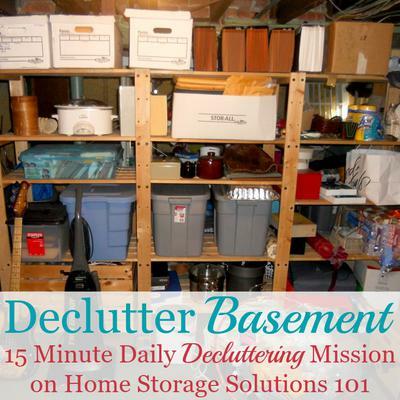 We're working on this Declutter 365 mission as part of the Basement Organization Challenge here on the site, which is one of the 52 Week Organized Home Challenges. As always, the first step in any organization project is to declutter, so if you want to get your basement organized first you've got to remove all the clutter from it. Removing all the clutter from your basement can seem like an overwhelming task if you've got a lot of stuff in there, and make you feel like it's not worth doing. So whenever that feeling happens, to try to get past it, I suggest that you break up the task into 15 minutes at a time. Small steps make the process go more smoothly, and seem much less intimidating. That's why 15 minutes is your decluttering weapon. 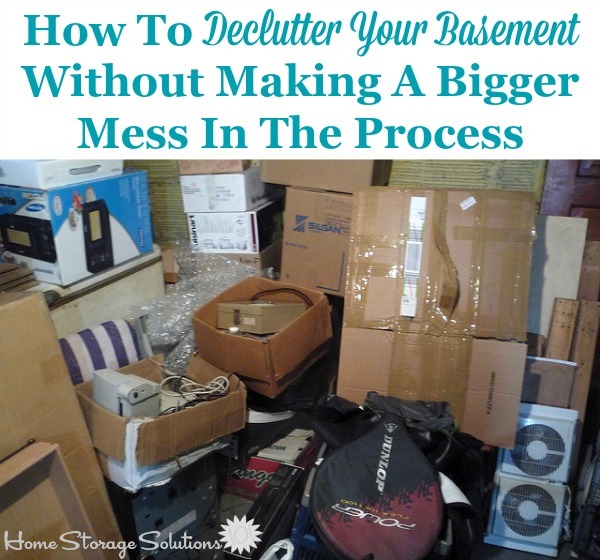 That being said though, there is a certain order in which you should tackle your basement clutter during those 15 minute sessions to make the process as easy as possible, take the least amount of total time, and so you don't make an even huger mess during the process (to the extent possible). As discussed in more detail in the basement organization challenge, your basement can have several different areas and functions, the most common ones being a utility area, storage area, and/or living area. Before you begin you should assess how you want your basement to function for you, once it is decluttered, plus, what parts of the basement are the most cluttered and in need of help. 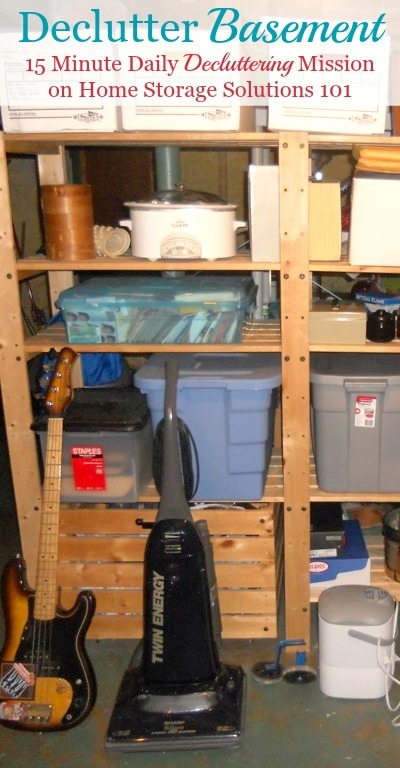 This article focuses mainly on how to declutter a basement that is used as a storage area. However, if you need to declutter a basement that is used as a utility area or laundry room, check out the article about how to declutter your laundry room here, since it will give you good guidance. Similarly, if your basement is finished, and you use it as a living area, such as a playroom or rec room, or something similar, check out the article on how to declutter your living room for more ideas. If you decide your priority is to declutter the storage areas in your basement, then read on below to find out how to take on this task without making a bigger mess during the process. The key to not making a mess while decluttering is not to start moving all around the room, but instead to systematically deal with the clutter as you find it. For storage areas this often means one box at a time, or one shelf, or one drawer, or one pile on the floor, whatever. Deal with everything as it comes, instead of saying to yourself, "ummm, I don't know what to do with that, so I'll come back to it." As you deal with each object systematically make your choice of what to do with the item, working through the basement from your starting point, and going from left to right. Check out the how to declutter article for full details of the process, including a discussion of the 6 choices you have for each item as you encounter it, which is shown to the left. The reason this is important, and helps you not make a mess, is that you don't leave decisions unmade when you're systematic. Instead, you have to make a decision before you can move on to the next thing, so then you can put things in the right place in your staging area (which is what we're discussing below). Especially when dealing with cluttered storage areas, such as the basement, often there isn't a lot of clear space to deal with clutter. 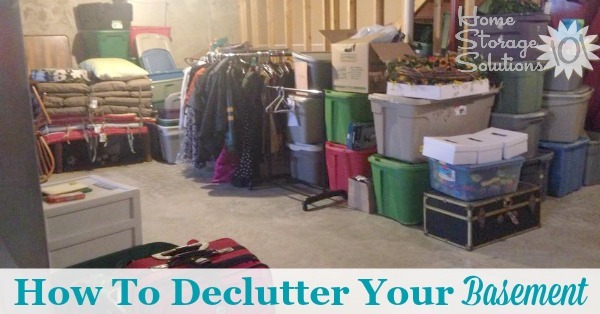 And during the process of decluttering you do need a bit of space to spread out since you're sorting items. Therefore, to the extent necessary, work first in your systematic way to clear out a staging area for yourself, if you don't have one, so you can pick up a box or bag or whatever, take it to the staging area, and deal with it completely before you go to the next one. Once you do have a staging area for your clutter, it becomes much easier to deal with everything. Plus the staging area is what keeps you from making a bigger mess, since you're going to be constantly cleaning it up during the whole process. Once this staging area itself begins to feel cramped and cluttered, before you continue your systematic approach in the space you're decluttering, go ahead and deal with each of your piles within the staging area, clearing it back out. Physically drop things off at the donation center, throw the trash into a dumpster, put the items away throughout the house that you decided should go elsewhere, etc. Until you actually deal with these sorted piles within the staging area you will feel like you're just moving your clutter around from place to place in your basement, and you will be. It is the process of dealing with the piles in the staging center that actually gets the clutter out of your home! In basements, especially, there are often lots of little things in boxes and bags and piles, and that is what you'll deal with in your staging area. But there will also be some large items, like old appliances, furniture, or whatever else, that is large. It will most likely take extra effort and thought to figure out how to move these items, if you choose not to keep them, out of your house and properly dispose of them, or donate them. The sooner you can get rid of these larger items the more free space it will clear up in your basement. Often times though these things are buried behind and under other stuff, or it is too difficult with other clutter in the way to get these things out, which is why I left it later in the process, but make sure you do, at some point, deal with these large items. Once you do you'll really see immediate progress, which is itself motivating to continue. Finally, once you've gone through your entire basement systematically, and repeatedly cleared out your staging area of clutter as you dealt with each pile or box, you'll be left with all of the items in your basement that in your initial sort you decided to keep. Now that you see what is left I always suggest another quick decluttering run through, because you often find more you'd really like to get rid of on the second pass. However, once you've done that second (and it will be much quicker) decluttering pass, you are now ready to begin sorting and organizing the items you've got left in your basement to properly store them. For ideas on that process check out the Basement Organization Challenge article I mentioned above. However, to get you inspired first to get your decluttering done, make sure to look below to see photos from readers who've already done this mission, showing their results. They did it, and now you can too! 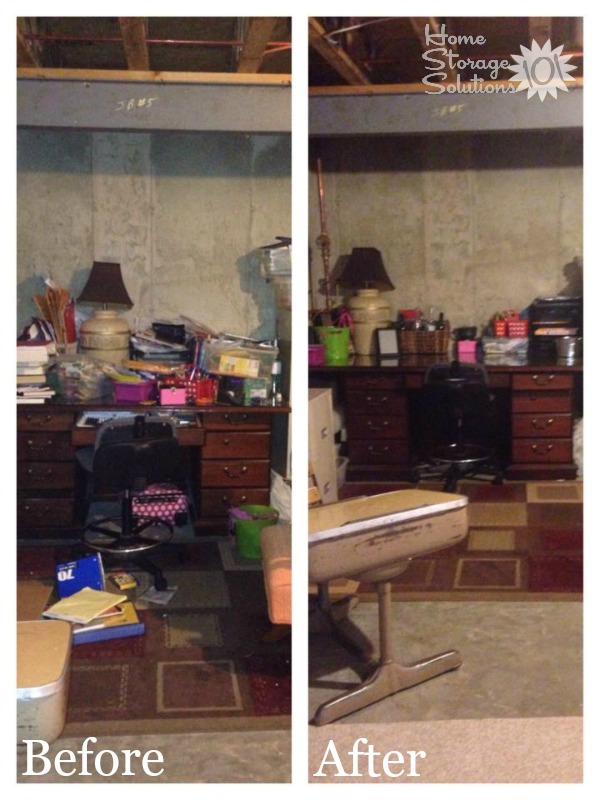 Here are before and after photos from a reader, Monica, who worked really hard on her basement. Wow, look at the difference! She did a great job, didn't she? 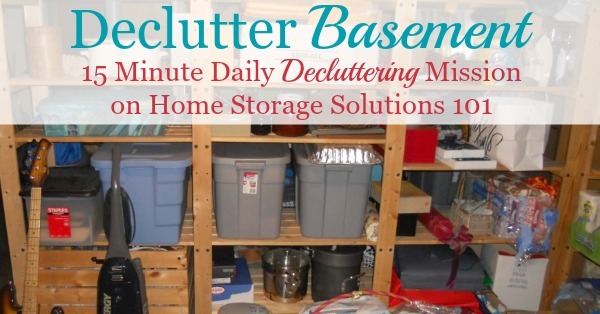 Are You Ready To Get Rid Of The Clutter In Your Basement? Here are a couple more photos from readers who've already done this mission to hopefully get you motivated to tackle your own basement. The photo above is another collage from Monica, who said, "Today's task was basement desk area." She did a great job, didn't she? 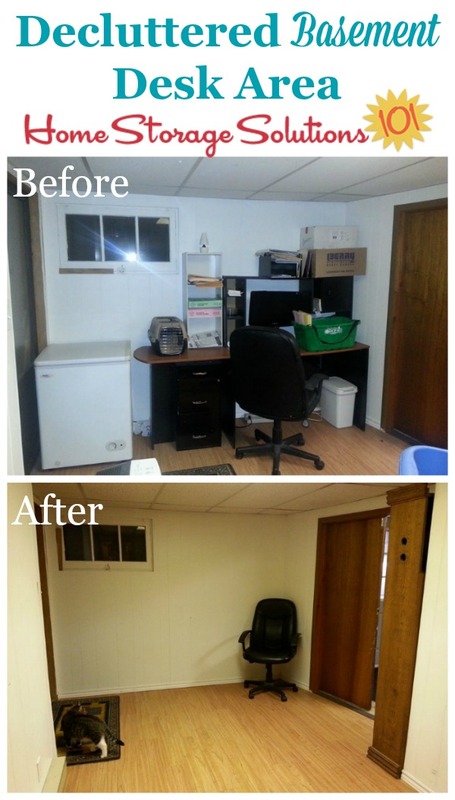 In addition, here's another set of photos, from a reader, Nina, who showed the before and after area of her desk area in her basement. As you can see from the photo Nina's basement, at least this section of it, is finished and used for living space, instead of just storage. She said of the before picture, "Desk area in basement that I never used." Then, of the after photo she said, "Desk is gone, file cabinet is moved upstairs where I will actually use it. One box of important tax files going to attic, and two bags of garbage out the door!" I hope seeing these pictures, plus my instructions, have inspired you to start decluttering your basement. 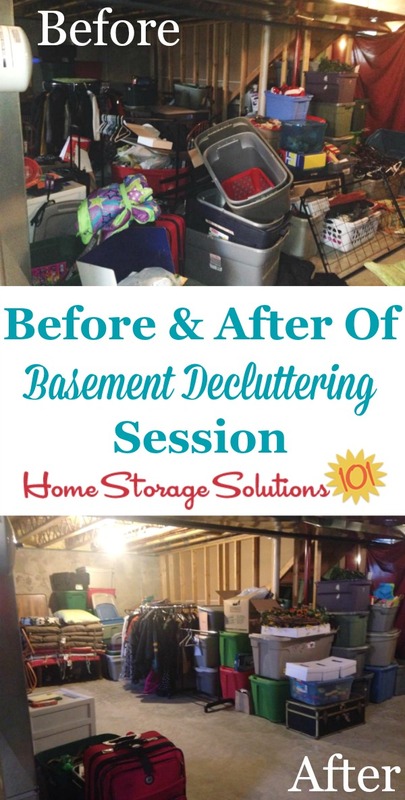 Comments for Are You Ready To Get Rid Of The Clutter In Your Basement? My basement has a lot of stuff for babies, bassinet, swing, etc. which do not break down. I do not need this stuff today, but my husband and I have been trying for another child and hope that we will need these again in the near future. Are there any good ideas for this stuff or does it just take up feet of space until it’s time to use again? I use fairly large semi-clear bins that will fit on the rigid plastic shelves, which were purchased and assembled. Each bin is labeled with index cards. Seasonal bins, holiday, picnic supplies, light bulbs, extension cords, etc. Just the two of us now and both of us are retired. When the kids moved into their own places they took what they wanted of their own things. Rest was sold/donated/tossed. We do have a closet in an unused bedroom that has some things, luggage, covered in plastic bags, seasonal clothes, office type supplies, etc. Large rarely used items are stored in the 2nd floor of garage; canning jars, flower pots, potting soil, outside furniture, etc.